← Banking’s Two Challenges . . . are Really One! Several hundred years ago, most people believed the world was flat and somewhere, out there, was the dangerous edge. This was a commonly held belief and as a result influenced many actions among those who made their living on the sea. Most trade and commerce routes kept in sight of land. Large heavy anchors were required in case a ship needed to stop itself from being pulled over the edge. Most long trading routes were overland. However, when the general understanding of the earth as a sphere fully took hold, behaviours also changed. Trade routes across the oceans were opened up, spawning new industries. Ship building blossomed. Conquest of other lands to enrich your empire became easier. The “global economy” was born. Those who today continue to believe the world is flat are a tiny minority and generally considered grossly misinformed at best, and mostly just plain “wacko”. 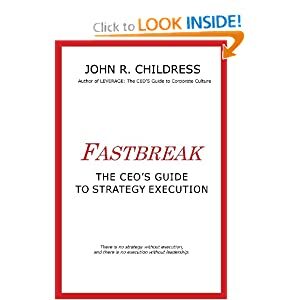 Yet in the world of organization behaviour and business performance, there are still those who steadfastly believe corporate culture is about “shared values” and that “values” define an organization’s culture. Unfortunately, they are the business equivalent of “flat earthers”. People have values, corporations have behaviours. But these are behaviours, not values. We can’t see, touch, nor can we manage values. And depending upon your upbringing and culture, the value of ‘respect for others’ may look very different to a Japanese business person than one from the US. Value statements can be interpreted in many ways. Behaviours are much more binary and easy to observe. I have asked dozens of CEOs and senior executives over my 35 years of work on leadership, culture change, performance improvement and business transformation if they have ever seen a value: “Can you show me a value?” They shake their heads in mild chagrin. I’ve also asked to see reports for Values KPIs and program management plans for corporate values. Nothing! Life is a cruel teacher. She gives the test first and the lesson afterwards! When I give speeches to senior teams or audiences of senior executives, I almost always do this simple test with the group. I first ask: “How many of you believe that values and value statements are important in running an effective organisation?” All the hands shoot up. I then ask them: “How many of you work for an organisation that has published their values or value statements?” 90+% of the hands again go up. Then I ask them all to pull out a piece of blank paper, grab a pen or pencil, and write down the exact values or value statements of their company. As you can imagine, there is a gasp and then a very awkward silence with much fumbling around and shifting in the chairs. The results? Over the past 35 years the average has been that less than 50% of the audience can actually recall and accurately write down their company values or value statements. And these are the senior executives! I did this recently with a financial services organisation in London, which had just 4 simple values. Only one of the 8 senior executives in the room got them all correct! Why, if values are espoused by consultants and psychologists as so important to running effective enterprises, are so few senior executives able to write them down, much less live them day-to-day? Simple, values aren’t real, nor are they visible, and as this example shows, not very important to how leadership thinks about its business! Enron had it’s shared corporate values chiselled into the granite on the side of its Houston headquarters and proudly displayed in their annual reports. I guess 4 were just too many to remember! However, ask a team of senior executives to write down the common behaviours that occur in their company that get in the way of innovation, strategy delivery, employee engagement and other important business issues and they can list them perfectly! 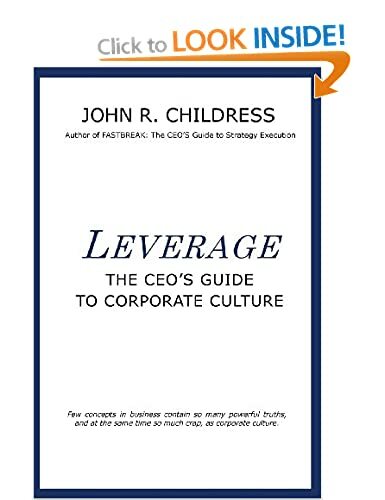 Realising that corporate culture is really about accepted and frequent behaviours, and not values, is a profound insight that opens up highly productive approaches to reshaping culture and bringing culture into alignment with the business purpose and strategy. With this one insight we can now develop effective culture change approaches and culture realignment processes that quickly get results. The “Values believers” say it takes 3-5 years to change a culture (probably never if the senior executives can’t even write down the values). A behaviour based approach, using the power of internal social networks (subcultures), behaviour change through peer pressure and the human need to “fit in”, as well as “active leadership” and revised policies and business processes to encourage new behaviours, makes culture change far more sustainable as well as less invasive than the Values Roadshow Workshops that are so prevalent with culture change consultants. Culture change is the replacement of one set of “accepted and frequent behaviours” for another. This entry was posted in consulting, corporate culture, ecosystems, John R Childress, leadership, Organization Behavior, strategy execution, the business of business and tagged behavior change, CEO, change leadership, change management, Corporate Culture, corporate values, culture change, flat earth, flat earth society, leadership, Magellan, senior executives, shared values, sustainable behavior change. Bookmark the permalink.